All over the world, coffee remains the beverage of choice for after dinner drinks, for the morning rush or for a lazy Sunday evening. Coffee arouses, exhilarates and renews the body, mind and soul in ways we cannot describe. It also comforts and calms the fortunate drinker. Drinking coffee is one of the ancient joys in life. In the art of coffee making, the basics must be there. You must have good ground coffee. Get the best quality Italian beans or French roasted beans, or you can get the popular blends like Java or Mocha. As soon as you have this, now it’s time to get some quality equipment. Home brewing machines help create the finest restaurant or café style coffee. You can find them in various sizes, brands and pricing. The best is to get one that suits your needs and lifestyle. Once you have your coffee grounds and equipment, it is now time to make some coffee! The easiest brew you can make is black coffee. Black brew coffee is the most popular type in the United States, and most parts of the world. You just need to make sure you put in the correct amount of ground coffee into your machine and do the necessary steps to make the brew. Black coffee only requires coffee grounds and hot boiling water. Once you have your black coffee brew, you can add in milk and sugar. While most people drink black coffee without sugar or milk, some prefer them with milk only or sugar only. Some of the popular ingredients that are added into a basic cup of coffee are cinnamon, nutmeg, cardamom, cloves, chocolate shavings, marshmallows, flavored syrups and liquor. Spices are added to flavor the coffee whereas chocolate shavings are both decorative and popular for milk-based coffees. Marshmallows form the basis of most coffee art and flavored syrups are commonly used for lattes and cappuccinos. Coffee laced with alcohol does double duty to your body, giving you a good kick while perking you up. Some common liquor added to coffee is rum, whisky, brandy, cognac and chocolate liquor. Coffee art is the art of drawing images onto the surface of coffee. It is designed by using coffee crema or the top layer of foam. Coffee art is done by pouring the milk directly into the coffee, while either wiggling or moving the spout up and down to create patterns and waves. 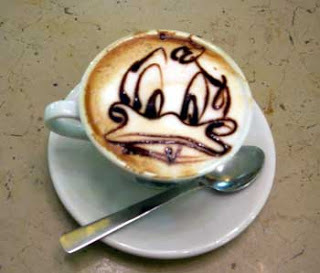 Etching is also another way to do coffee art. Etching involves using a coffee stirrer. This enables more intricate patterns and drawings. Stenciled art is the latest form in coffee art. Ground coffee or cocoa powder is dusted to the surface using a stencil onto the coffee. Just like wine, coffee also needs to be served in the right vessel to allow its aroma and flavor to be rightfully savored. Normally, porcelain cups are used to serve hot coffee as they are not porous and can keep the coffee warm. Both brew and flavor is preserved naturally. 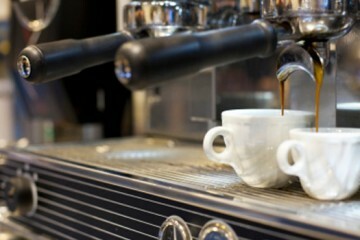 Heatproof glass cups and mugs are normally used to show off the texture of the coffee, such as lattes, and macchiato. These glasses normally come with a handle to prevent hands from getting burnt. Stainless steel cups and mugs are ideal for travelling as it retains heat and flavor well. While drinking a cup of coffee is enjoyable on its own, the coffee drinking culture has evolved to include other food items. When serving coffee, you can pair it up with cakes and muffins. Carrot cake, banana cakes and muffins are good with coffee, as coffee provides an after-swallow drink to wash these down. Biscotti is also another popular choice. Its sweet and crunchy texture is a perfect complement to strong coffee. Biscuits are a popular treat for the English Afternoon tea and coffee is also savored with shortbread and scones. Chocolate brownies, fudge, and waffles are also a welcome treat and are an option to be served in the morning or during tea time. These savory treats balance out the bitterness of coffee. In Hollywood, the stars also start their day with some coffee. Jennifer Lawrence loves adding cinnamon to her coffee whereas Elijah Wood orders espresso over ice. Kit Harrington loves his Java from the local 7-11 in Vancouver.